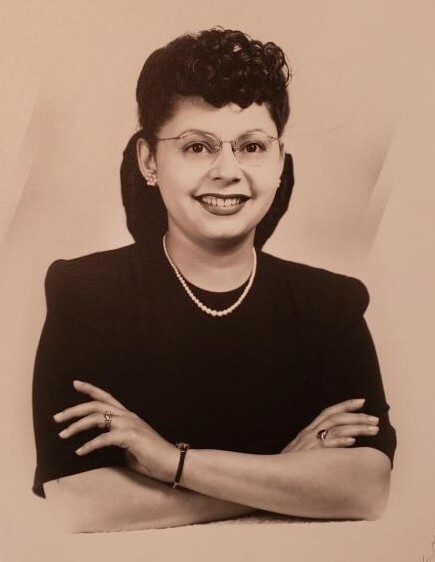 Maria del“Carmen” Burcham, 92, of Carlisle, PA passed away Thursday, March 28, 2019 in the UPMC Pinnacle Carlisle. She was born July 20, 1926 in San Antonio, TX to the late Jesus and Belen (Mendoza) Salazar. Carmen volunteered at the Seventh-Day Adventist Hospital, Shady Grove, MD and the Carlisle Hospital gift shops, where she created artificial flower arrangements for sale. An excellent cook, she also enjoyed sewing and Ikebana, Japanese flower arranging. Surviving is her loving husband of 73 years, Lee Aubrey Burcham, Ph.D., Colonel, USAF Retired; daughter, Anita Reid of Frederick, MD; and brother, Dr. Cervando Salazar of San Antonio, TX. A viewing will be held Monday, April 1, 2019 at 5:00 PM until 7:00 PM in the Hollinger Funeral Home & Crematory, Inc., 501 N. Baltimore Ave., Mt. Holly Springs, PA 17065. A graveside service will be held Tuesday, April 2, 2019 at 10:30 AM in the Indiantown Gap National Cemetery, Annville, PA with Rev. Richard L. Reese officiating. Memorial contributions, in Carmen’s memory, may be made to St. Jude Children’s Research Hospital, 262 Danny Thomas Place, Memphis, TN 38105. Visit www.HollingerFuneralHome.com for condolences to the family.